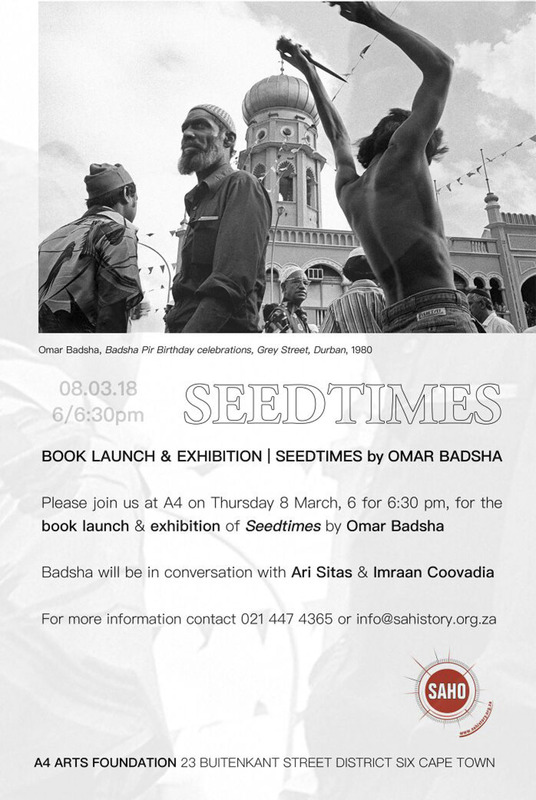 Book launch and exhibition of 'Seedtimes' by Omar Badsha. Badsha was joined in conversation by Ari Sitas and Imraan Coovadia. This is a moment: I was walking to my office through this area, an area that I grew up in and I noticed this man, long before he got to that spot, and I followed him, because he was very dignified, very unusual, and he... there is a series of pictures of him, I have of him at the edge of he crowd and he, slowly making himself to this.... And I followed him and I then stood back and I concentrated on him but, this was the moment. Ari: Can I say one little thing and then leave it with you? This époque, it’s high apartheid, there’s a tentative crowd, who’ve got a distance, there is a cop watching the performer – you don’t know what violence may be unleashed, there is the peculiar moment, in history, we’re talking about history, where something is unfolding – look at the faces, everybody wants to be part of the performance but they are three meters away.... Here, what is this cop doing? Watching the performer – what would he say? What is he saying? What will he be saying?